The MGM Grand in Las Vegas, Nevada was the host site for tonight’s pay per view offering by Al Haymon’s Premier Boxing Champions. Several title fights were on this card in addition to the main event of Manny Pacquiao and Adrien Broner. The first bout of the night was between <strong>Hugo Ruiz (38-4) and Alberto Guevara (27-3)</strong> in the featherweight division. Ruiz was the taller and longer fighter of the two, and he had to face Guevara who had to step in as a last minute replacement, and his body looked like he hasn’t been training heavily in the past few weeks. Ruiz was able to land two short right hands followed by two short left hooks in the first round that sent Guevara down to the mat, but he was unable to follow up on that and finish the fight early. Ruiz was throwing a little more power into his shots in the second round, and was able to do good work to the body. Ruiz continued to walk Guevara down in the third and fourth rounds, but he wasn’t throwing enough combinations to seriously hurt or threaten Guevara. Ruiz was warned for a low blow in the fifth round, but still landed more shots than Guevara despite the action slowing down. Guevara was able to land some counters in the seventh round, but was fighting off his back foot in the eight round and was not throwing enough punches to win an otherwise winnable round. It looked like Guevara is fighting to just survive and not go for the win. He has to know he’s behind on the scorecards but he didn’t take any risks in the final two rounds of the bout. Ruiz wins a lackluster decision with scores of 100-89, 99-90, and 99-90. The next fight of the night was between <strong>Nordine Oubaali (14-0) and Rau’shee Warren (16-2) (</strong> for the WBC Bantamweight title. Both Oubaali and Warren fought as southpaws, and they previously met in the Olympics when Oubaali was able to defeat Warren. Warren showed good hand speed early on and Oubaali was a little short with his punches. Warren’s jab was accurate early, and he may have had Oubaali a little hurt in the third round. 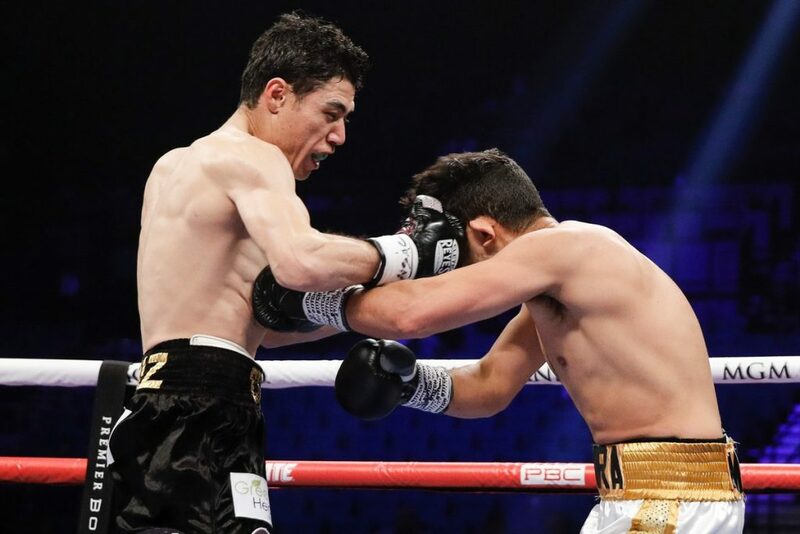 Oubaali began to turn the tide of the fight in his favor in the fourth round when he landed a counter left hand near the end of the round, and he had a strong fifth round with some check right hooks and lead right hands. The sixth round was a close one, but Oubaali may have hurt Warren at the end of the round with a good left hand. Warren unwisely got in a firefight with Oubaali in the seventh round and may have lost the round as a result. 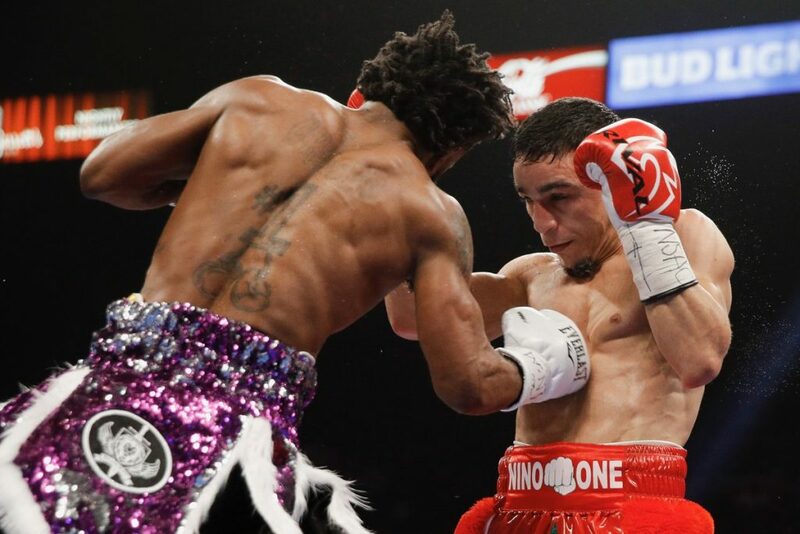 Warren, to his credit, continued to exchange with Oubaali in the eighth round. Warren pressed the pace in the ninth round but got tagged with some good power shots, and Oubaali was more accurate with his counter shots in the tenth round. Warren likely stole the eleventh round with his activity and pressure, but it appeared to many he needed a knockout in the last round in order to pull out a win. That knockout didn’t come, but overall there were many close rounds. The judges scored the fight 115-113, 116-112, and 117-111 for Nordine Ouaali. The co-main event of the night was between <strong> Badou Jack (22-1-3) and Marcus Browne (22-0) </strong>for the WBA Interim Light Heavyweight Championship. Browne had the slight height and reach advantage on Jack and was able to use it to his advantage early on. He pressed the pace more in the opening two rounds and kept control of the center of the ring. Browne was able to land some good shots to the body in the third and fourth round, while Jack was unable to land any notable punches on Browne’s body or head. Browne opened up a cut in the middle of Jack’s forehead after a headbutt and was later deducted a point in the seventh round. Browne was landing clean combinations in the eighth and ninth rounds, as the blood dripped from Jack’s forehead and he appeared to be losing his energy. 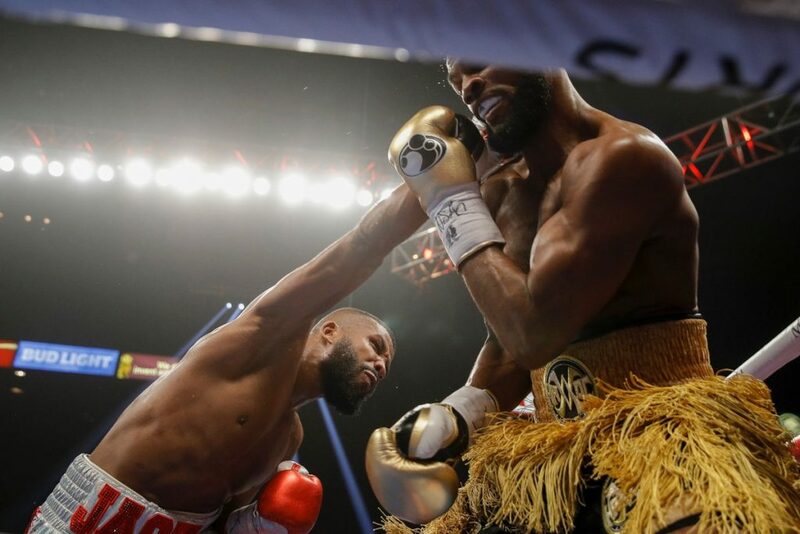 Badou Jack was able to make a brief comeback in the tenth round with a flurry of punches on Browne by the corner. Bit he wasn’t able to follow that up with any effective offense. Jack looked like a defeated fighter going into the final two rounds of the fight, as Browne looked confident he was going to walk away the winner. Browne went in for the kill in the final round as the blood was pouring out of Jack’s cut. The ringside doctor came out to check Jack’s cut, but allowed him to continue. Jack was able to finish out the fight, but he had a crimson mask of blood. The final scores of the fight were 117-110, 116-111, and 119-108 for Marcus Browne.